What to do on a rainy day? Wine tasting, of course! Yesterday even though it was raining; my friend Pat, and my friend Sandy, and I went wine tasting…it’s a shock I know. I mean I do it so rarely after all! 😀 Since I usually go wine tasting around San Luis Obispo or take the 45 minute drive up to Paso Robles ,I thought it would be fun to go down to Santa Maria and Los Olivos. I rarely go down that way and felt that it was time to broaden my horizons. And even though we tried nearly all the wines at the wineries we visited, this blog would be ungodly long if I was to describe every wine at every winery we tasted, so I’m going to discuss the ones we liked best or those of the more unusual variety. In any case we started in Santa Maria with Kenneth Volk which is considered a “far out” winery because it is off the beaten path, so it really put us behind schedule when unfortunately due to an unexplained power outage their tasting room was closed. We all hopped back in Pat’s truck and took off down the road to Riverbench winery, where the minute we walked in we were greeted by the very friendly winery dog, and a lovely employee, named Krysta who was pouring behind the counter. We began with the 2010 Bedrock Chardonnay which used no oak in the process and instead was fermented in stainless steel tanks so it didn’t undergo malolactic fermentation. It had nice aromas of lime and tangerine and was really crisp and light almost like a Sauvignon Blanc. This was Pat’s favorite wine. The 2009 Estate Chard which was given the Connoisseur’s Guide Score of 93 and received 90 points from the International Wine Cellar was my favorite (I bought a bottle). It had a nutty, toasty, malty aroma and I picked up malt, grapefruit and other citrus on the palate. This is a big white that the winemaker named “Mr. Chardonnay” for good reason. Sandy’s favorite was the 2007 Estate Pinot Noir, which is unusual for her because she is usually a white wine person. It had smoky, woodsy flavors with hints of clove spice on the finish. After leaving Riverbench we drove over to Foxen Vineyards. 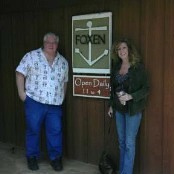 Interestingly enough Foxen has 2 tasting rooms down the road from each other and they pour different wines in each. The main and beautifully appointed tasting room pours Burgundian varietals and “the shack” as it is known, located at 7200 Foxen because it is literally a shack, pours Bordeaux varietals. We started in the main tasting room and met Sally a very knowledgeable and friendly woman who was working on her birthday. She couldn’t stop raving about how wonderful it is to work at Foxen and how well they treat their employees which of course IMMEDIATELY endeared me to the winery. We started with a 2010 Chenin Blac which is actually a bit rare to find here in California, it was fermented in 50% Stainless steel and 50% new french oak. The grapes came from 40 year old vines and had a yeasty, buttermilk nose but honey and apricot in the mouth and it had a long finish. Sandy thought it tasted more on the sweeter side. I really found the 2010 Bien Nacido Steel cut Chardonnay to very interesting. It’s grown on 3.2 acres that the winery has total irrigation control over with a 25 year lease and fermented in stainless steel. On the nose it had banana and guava and on the palate the tropical fruits were HUGE, with massive guava and papaya flavors that just burst in your mouth. After trying a few of the Pinot Noirs we moved on down the road to the shack, where they had a 2009 Volpino which is a blend of 80% Sangiovese and 20% Merlot. The Volpino had a jammy bright nose and a beautiful light ruby color in the glass. It tasted of strawberry jam and white pepper with some tannins but nothing over whelming. 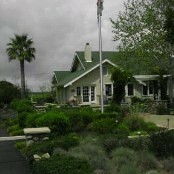 The 2009 Cab Franc from Rock Hollow Vineyard, is grown in the Alma Pintador corridor of the Santa Ynez Valley. It was really enjoyable and had a friendly almost Port like nose. In the glass it had a soft ruby color and tasted of rich blackberries. The mouth feel was very nice and balanced. Then we were poured 2009 Mission Port from Barbarena Vineyard. It was surprisingly delicate and sweet. It tasted of carob, light pepper, and espresso mixed with mulling and allspice and a hint of orange peel. This was one tasty little treat. We left there and went to Tres Hermanas winery I’ve been here once before and didn’t find the tasting room staff to be all that friendly, but decided to give it another try. This time our tasting room person turned out to be the mother of the 3 sisters that the winery is named after. Considering she was there to sell wine she wasn’t very friendly or knowledgeable. She seemed to like Pat A LOT, but appeared put out and inconvenienced by Sandy and myself even though we were the only people in the place. Because they had a huge wine list but only gave a 6 tastings per person option, we decided to spread them out and share the tastings to get the maximum number of wines tasted, which after a while became confusing because we couldn’t remember which wine was whose. Initially Pat was poured the 2008 Cuvee Haliegh which is a blend of 65% Riesling and 35% Gewurztraminer. It had a very fruity and floral nose with honey dew and white flowers. It was actually quite dry with very little sweetness to it on the palate but had a nice and sweet finish that wasn’t in anyway overpowering. Someone was poured the 2007 Pinot Gris which reminded me of smelling Welches white grape juice with green apple and apricot notes. On the palate the flavor was almost all pureed pears with stone fruit highlights. At some point toward the end of the tasting I think I was poured the 2005 Syrah/Sangiovese. Which is a blend of 70% Syrah and 30% Sange, and had a coffee, espresso nose. The wine itself was well balanced with bursts of currant, cherry and blackberry. Pat felt their white wines in general were elegant, well balance and had a long finish with a nice mouth feel. Lastly we hit Koehler, where we met uncle Dan, who is Krysta’s (from Riverbench) uncle. He was pleasant and knowledgeable. we noticed on the drive into the vineyard that some of the vines were budding and others hadn’t. When we asked about the visual discrepancy, Dan told us that the chard had budded a month ago and they were still waiting on the Cab and Mourvedre to begin budding. We started with the 2010 Sauvignon blanc, the “Chill it and Kill it” wine. It had a nice balanced feel on the palate and tasted of kiwi, grapefruit and some grassiness with a sweet kick. The 2007 Cabernet Sauvignon is 100% Cab and won a Silver Medal at the 2011 San Francisco Chronicle wine Competition. It had a robust mouth feel was Big and Jammy with some pepper and Blackberry jam notes. Their 2009 Red Quartette has everything but the kitchen sink as they like to say, and is 50% Sangiovese, 26% Grenache, 20% Cabernet Sauvignon and 4% Cab Franc.This deserves a mention because after all day wine tasting by the time I hit this wine, I’d put a star a descriptor next to it”s name…so I must have liked it! All in all a great way to spend a rainy day with friends and because of the rain it kept the tasting rooms pretty crowd free. What a fantastic rainy day idea! The Foxen Valley Wine Trail is refreshing and off the (usual) beaten path. One of my favorites is Rancho Siquoc Winery … and both their 2009 Malbec and 2009 Sylvaner were amazing! Sylvaner is an amazing wine, Heather. A deliciously different white that I enjoy very much.